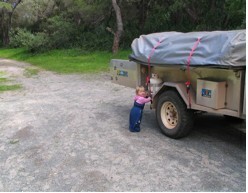 We’ve just come back from another camping trip and just wanted to let you how great we’ve found the camper trailer we bought from you last year. 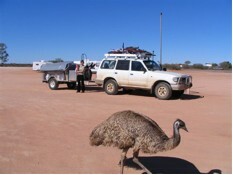 As you now we bought the camper trailer to take a trip around Australia. And when we told our friends the first thing they said was, “What about the job, mortgage, baby, 5yo and 6yo? ?” And our response was “Quit, rent the house, get a portacott and by the way – the older kids will just love it”. The decision was made. And we had six weeks to prepare. One of the biggest decisions was the type of camper we wanted. The choice in the market place was overwhelming and we did a ton of research. We were lucky enough to come across you at 3 Dog Camping after looking at what seemed like hundreds. 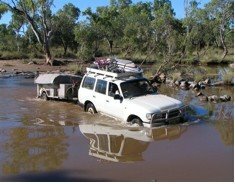 • Designed to handle dust, rivers, rough 4WD tracks and thousands of kilometres on corrugations. • Flexible to add on rooms and shade options. You and all the staff at 3 Dog Camping were great to deal with and because you’re campers yourselves, we can see why you’re so passionate about the designs and quality of your product. 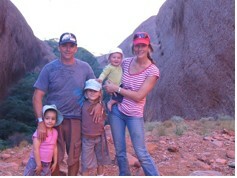 We did our big Australia trip in 2007 (and have done numerous smaller trips since). We did 25,000 km and met people from all over the country. 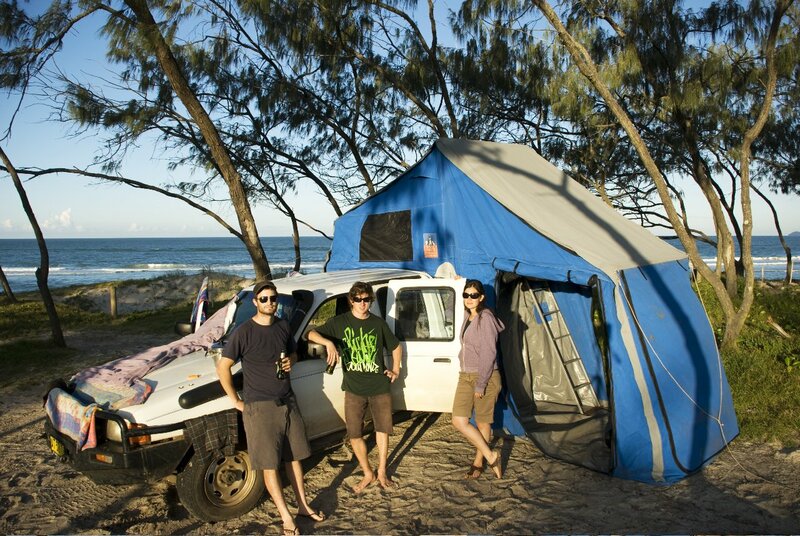 We had some of the best times of our lives which was enhanced by the set up and reliability of our camper. 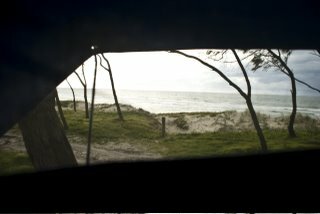 The camper was tested with gales and torrential rain in the Flinders, deep river crossings in the Northern Territory and seemingly endless corrugations exploring the Cape Leveque area. Some of these roads made the infamous Bungle Bungle road look tame! We’re back home now and still camping on weekends and holidays. Martine and I can still say we made a great choice in our camper and don’t aspire for anything different. Your after sales service is fantastic, friendly and helpful. For the price, reliability, set up and good people to deal with we don’t reckon anyone could do better. 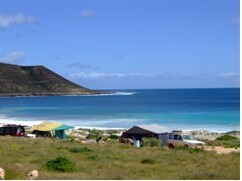 If anyone ever wants to talk to us about our trip or your 3 Dog Camper Trailer camper they’re welcome to give us a call on 0419 495494 or drop us an email at: mgudgeon@aapt.net.au And we’d be happy to help. 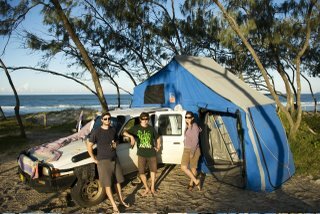 On a recent camping adventure with our Canadian friend Ryan, we parked our 3 Dog on the shores of beautiful Rainbow Beach. With all of the breathable 3 Dog screens letting in the ocean breeze over top of our elevated bed we had one of the best sleeps of our lives. 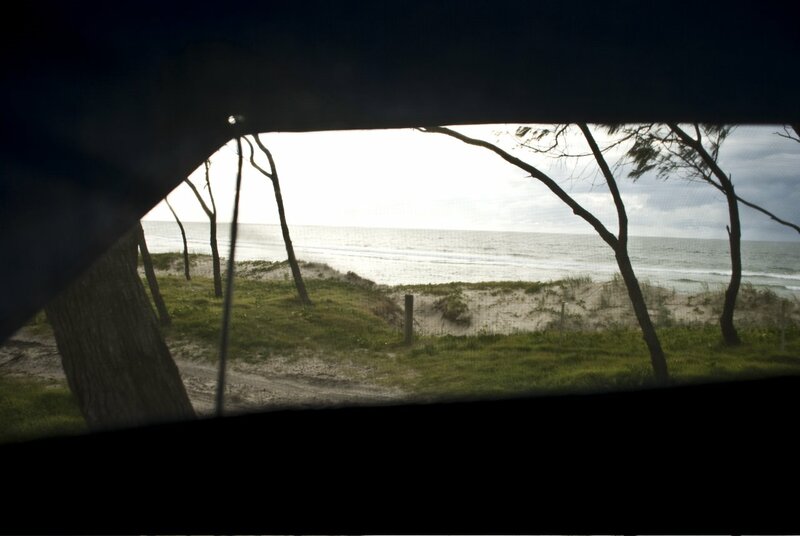 The ocean air blew through our 3 Dog all night long and in the morning all we had to do was open our eyes in order to watch the sunrise over the waves (have a look at the below photo to check out our penthouse view). If that isn’t 5 star accommodation, I don’t know what is.